One story was the gravitational center of the news universe last week and will likely continue to be a political lightening rod: the Trump Administration’s separation of immigrant children from their undocumented parents at the border. President Donald Trump insisted that the separations were the Democrats’ fault and that he was powerless to correct the situation – then on Wednesday corrected the situation. His executive order did not end the so-called ”zero-tolerance” enforcement policy at the border, and still allowed for the jailing of undocumented immigrants along with their children – a situation that was also widely criticized as wrong and potentially illegal. Neither does the order say anything about reuniting the parents and children, some of whom have been parted by thousands of miles. “There is no plan, no strategy” for that, Connecticut Sen. Richard Blumenthal said while visiting detention facilities in New Mexico. Kids in the custody of U.S. Customs and Border Protection in McAllen, Texas on June 17. The CBP released this photo. 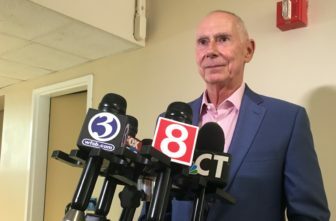 Most of Connecticut’s congressional delegation participated in rallies opposing the administration’s immigration actions and, like Blumenthal, flew off for Texas to see for themselves what kind of facilities would be set up to house thousands of immigrants from Central America. 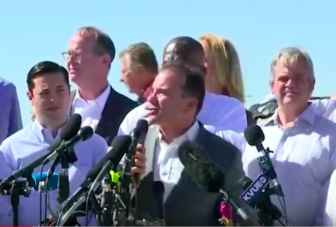 Ned Lamont, the Democratic Party’s choice to run for governor, was among those protesting the immigration policy; but his primary opponent Joe Ganim traveled to Texas to protest in his capacity as Bridgeport’s mayor. (Ganim, by the way, only officially became Lamont’s opponent on Tuesday when he and Republican David Stemerman each successfully petitioned their way onto their respective party’s primary ballot Aug. 14. Bob Stefanowski had qualified the same way the day before, leaving the head count of Republican gubernatorial candidates at five. Joseph P. Ganim outside the detention camp in Tornillo, Texas. Susan Hatfield, a Republican candidate for state attorney general, stood behind the President on immigration, while her opponent, Paul Doyle, urged the state’s three law schools to offer legal aid to immigrants facing deportation. The status of immigrant children was not the only immigration concern in Washington last week. Republican moderates and conservatives were pushing competing immigration bills in the House of Representatives, but were having difficulty coming to terms. One of the bills would punish “sanctuary cities” and states (like Connecticut) by making jurisdictions that refuse to cooperate with immigration authorities liable for some crimes committed by the undocumented immigrants they release. Despite their differences, Republicans, without a single Democratic vote, were able to narrowly pass a farm bill that does not overlook the needs of American-born children. It would, among other things, cut thousands of them from the free school lunch program and reduce the availability of food stamps. For the poor, living in Connecticut has not been cheap, as confirmed by a new study that says the state has the ninth least affordable rental housing in the nation. Not everything in the nation’s capital was as contentious as immigration, of course. The U.S. Senate on Monday approved a $716 billion defense authorization bill that allows the Pentagon to purchase more Connecticut-made helicopters, airplane engines and submarines. Republican gubernatorial hopefuls Mark Boughton and Timothy Herbst, meanwhile, got $1.35 million in public campaign financing after an earlier unsuccessful try before the State Elections Enforcement Commission. But Steve Obsitnik will have to try for a fifth time to qualify. No one really knows how much, but state Revenue Commissioner Kevin Sullivan says Connecticut could take in $100 to $200 million in additional sales tax revenue now that the U.S. Supreme Court has ruled that online merchants must collect sales taxes and remit them to the states where their customers live. President Mark Ojakian answers questions about the new plan to merge Connecticut’s community colleges in 2023. Mark Ojakian, president of the Connecticut State Colleges and Universities, says the institution’s new consolidation plan, when fully implemented in five years, will also save millions while maintaining the school’s accreditation. The Board of Regents for Higher Education approved it Thursday. Monday legislators return to the State Capitol to consider overriding a number of Gov. Dannel Malloy’s vetoes. The governor has already warned the lawmakers that overriding two of his vetoes — bills that would limit the state bailout of Hartford and the governor’s authority over education aid — could inflame urban voters as elections approach.